A flight was diverted to Newark airport on Saturday with smoke in the cargo hold. Brian Thompson reports. All runways were temporarily closed at Newark Airport Saturday morning after a plane made an emergency landing for smoke in the cargo hold. A Port Authority spokesman said an Air Transat flight from Canada to Florida made an emergency landing at the airport due to reports of smoke in the aircraft. 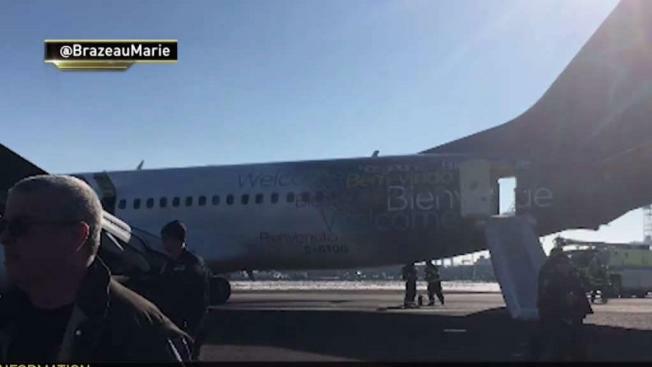 Chutes were deployed to get passengers off after landing. Air Transat identified the plane, a Boeing 737, as Flight 442 from Montreal to Fort Lauderdale. A total of 189 people were evacuated. Two minor injuries were reported, including a panic attack, the Port Authority spokesman said. The total closure last more than a half-hour and caused more than 140 delays for incoming and outgoing flights, according to FlightAware data. Planes that were diverted to other airports have now resumed routes to Newark, according to data posted by airlines in the terminals. The FAA noted on its website that there was a departure backlog at the airport because of the emergency. No fire was found and the cause of the smoke remains under investigation, the Port Authority said.